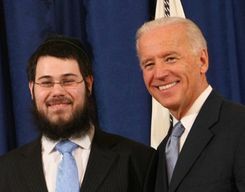 Representative of the Chief Rabbinate of Russia with foreigners Yakov Klein participated in a meeting with USA vice-president Joe Biden. Interfax-Religion asks Yakov Klein about his work in English-speaking community in Russia and his meeting with the American politician. - Mr. Klein, you work in the Chief Rabbinate of Russia with foreigners and English speaking Jews who live in Moscow. Could you tell us, please, about your activities in this sphere? What is main achievement in this field? What difficulties you have to face? - Our activities range from Shabbat and holiday programs, classes, Sunday Hebrew school and Jewish women's meetings. We enjoy working with our community, we love being there to help anyone in need. Each situation is different and unique but the bulk of what we do is help our fellow expats whenever needed. And give them the feeling of a home away from home. When the Lubavitcher Rabbi, of blessed memory, began sending Chabad emissaries throughout the world he insisted that the facilities being established be called Chabad houses, not centers or institutions, regardless of their size and structure. The Rabbi wanted to establish homes throughout the world that would be there for any Jew no matter where they were standing in their Jewish observance. He wanted every Jew to feel that no matter how far they may have traveled they will always have a place to call home. Our success is when we are able to provide that "Home." Our difficulties are usually technical ones - when planning an event? But overcoming them we prove that we are on the right track. We know that God created our world imperfect so that a man can work and improve it. It's our great chance - to have a possibility to help the Creator! If we don't work, don't create - we can't be happy. Money, income is only one result of our work. If a person has a large fortune or earned big subsidy he doesn't have to work. But for a Jew it is not the reason to quit working. Work and difficulties in it accompany us from birth till the end, because it is a commandment, it is pleasure. - What about the members of the community? Could you portrait them? - We sport all different kinds of members. Singles with Russian roots, who have lived and some even were born abroad, returning to Moscow for business opportunities. We know that each person in our community has come to Russia from various parts of the world. We have citizens of France and Turkey, England and USA, we even faced in Russia with traditions and special mentality of Jews from Iran. It is positive experience for all of us. It gives us understanding of Jewish tradition in its various aspects. I think that local Jewish community is very open and bright and try to help to so many people as possible. We have families that have moved here for a period of time to work either in Moscow embassies or again for business. We also provide services to those who are coming to visit and would like to have a closer look at the Jewish community here in Moscow. Another beautiful part of our community are the exchange students that join us for a few months. And our goal is to create conditions for full Jewish life of all these people during their stay far from their home. -Why did you decide to be a community leader? What did you graduate? - I am the youngest of a family of ten children all of my siblings are doing the same work: Community leaders all over the world. Growing up in such a family it was always my desire and ambition to do the same. I was born in New York City. I have studied and done outreach work and joined leadership programs around the world: USA, Israel, Canada and Australia. I was ordained Rabbi by the Late Chief Rabbi of Israel Rabbi Mordechai Eliyaho, in 2004 at the Rabbinical college of America in Morisstown, New Jersey. Why it so happened that I came to Russia? I think that if Jews leave the country of their origin they better go to Israel. But at the same time I will be the last to tell people where to live. As the Talmud says "each step of a man is from God," if a person lives somewhere then it God's will. A Hasidism founder Baal Shem Tov said that even if a person lost his way - it is also from God! We don't always understand why He led us here, but He did it and this is His will. - As we know your wife is also getting involved in the community work? How do you cooperate? - "Also" is a small word. We moved here as co-Directors and we each add to our community life in a different aspect. From the very first moment we have moved here, we have been working together, each focusing on what we do best, with the same goal in mind. - What about the lively and funny moments of your work? Do you think the English-speaking Jews feel comfortable in Jewish life of Moscow? Is it easy to be a Jew in Moscow? - We must say that besides for the harder issues we encounter, when we are asked to help in a not-so-happy situation, our work is pretty fun and funny. When we get together be it in the community center or at our home we always end up laughing about and comparing the "skills" we built since we arrived. Being a Jew in Moscow has become extremely doable due to the timeless work of Rabbi Lazar and his staff. Kosher food and Jewish education are available and the quality of both is unprecedented. - Do the members of English-speaking community cooperate with Russian speaking members in some activities? - Yes, in the past we have had members of the English-speaking community organize and volunteer holiday programs for Russian children of the orphanage and at other events. Often at our Shabbat dinners we are joined by local Jewish youth that are learning English and come to experience the Shabbat together with us. - What could you tell us about the interesting religious or cultural events that recently had happened in your community? Just this week we held our monthly JWC (Jewish Women's Circle) we had a group of women come over and learn about the upcoming holiday of Purim. Alongside this we have our weekly Sunday school. We strive to keep the curriculum fresh, fun and diverse by covering a wide range of Jewish traditions, heritage, history, and culture. Sunday Hebrew school instructors bring the Jewish traditions to life and share their own love and passion for Jewish life. - You also participate sometimes in political and interreligious meetings with English-speaking politicians and religious leaders. For example a few days ago you were on the meeting with USA vice-president Joe Biden. Could you tell us, please, about the meeting and your understanding of this visit? - The meeting was a very positive one. Vice President Joe Biden has stated that America is interested in the development of democracy in Russia, Instead of the traditional round-table discussions, Biden spoke with each of the twenty participant individually for two-three minutes. When I spoke with him he stressed that he is here on this trip with his granddaughter and before coming to Moscow he was in Prague, he took his granddaughter to see the oldest synagogue in Europe. When each of his three children became 15 he took them to Europe and to Germany to see the camps, he stressed that the Holocaust can happen again and its our responsibility to educate our youth and to prevent it from happening. We spoke about his past visits to the former Soviet Union, and how things have changed for the better for Russian Jewry. He thanked the religious leaders for all the work they are doing here, and said that true Democracy is on their shoulders. - What would you wish to Russian Jews and Interfax-Religion visitors? - I'd like to offer my best wishes on Purim. The source of joy is in human soul. Purim commandments demands certain social activities, but in fact their goal is to form human soul as the soul becomes different, it becomes capable to feel true and constant joy. What does the Ester scroll tell us about? About complete hopelessness. And the Almighty in response to our repentance and prayers gives a new situation. He creates new motivations for our actions, but we should act. God hears us and gives us new potential according to our efforts, gives us a feeling that He is close to us and life has sense. Once a person came to me, he was in despair, he lost his job and it seemed to him that his life was ruined. He repeated: "What wrong have I done?" I told him that his question was not correct and he should ask "What for? Perhaps, the Almighty has different plans on you." This though was unexpected for him. He left meditating. Some time later I learned that he found a new, much better job. Purim is a festival of transfiguration: grief is changed with joy. And it is the school where a person learns to understand that trials are given to step up to a new level, to gain renewed spirituality. And I would like to wish this inner growth. I also hope that Jewish education, Jewish life will continue develop in Russia, providing our future generations knowledge that will help them become true members of Jewish community.